The Madrid masters is one of the annual highlights of the tennis calendar and takes place in the second week od October each year. 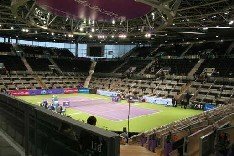 The event takes place in the Madrid Arena located just to the south of downtown Madrid (casa de campo) and involves the top 48 ATP ranked tennis players of the year. If you are like the rest of Madrid, and indeed Spain, and love your tennis this is the event for you! Packages - Events of this high standard traditionally attract the attention of specialist travel firms who will put together a suitable package that includes admission to the event combined with hotel and / or flights. You´ll have to pay around 25% over the normal price for these packages. The Caja Magica is located at the side of Madrids river Manzanares and has its own website where a full list of events are available.